It's been a while since I wrote anything. I forget I quite enjoy the process, even if it can be really time-consuming. Time to get back into it. Between a couple of meanders of the Danshui River there's an island that looks a little like an upside down teardrop. If that sounds quite idyllic, I'm afraid it's not. Sanchong and Luzhou are some of the densest parts of New Taipei City. The crowded southern area of Sanchong is never really spoken of very favorably. It's not without a few places of interest though. 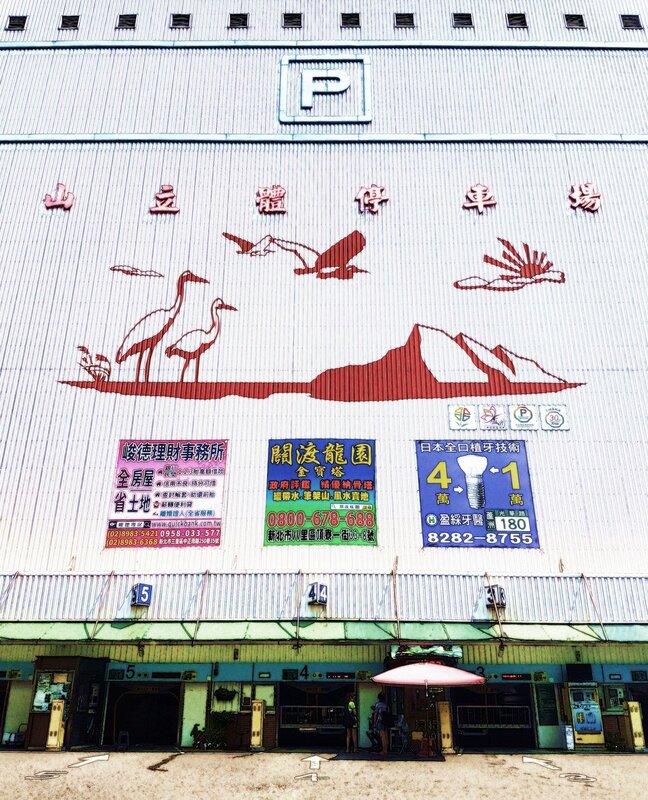 The northern half is Luzhou, New Taipei's smallest district. This area doesn't really seem to get much attention at all beyond an “isn't that where one of the orange lines ends?”, or “Is there actually anything in Luzhou?” Happily there is! I spent two afternoons in the district (thanks to the Forbidden City Museum's narrow opening times) and actually found some interesting sites. If you're someone just visiting Taiwan there are far better places to spend a day in. But if you live here it's actually worth a trip. I find a lot of stuff just scanning around on Google. I found both the Lee family home and the Forbidden City Museum this way and started making some plans. On checking around I could see what looked like the core of an old town (narrow radial roads rather than a grid, and a cluster of temples). There were also what looked like a few old farmhouses scattered amongst the concrete apartment blocks. Those pretty much indicate what Luzhou looked like pre-urbanization. The land around what was at that time a small town is fertile and rice from here was famous. I sketched out a rough plan and headed for Sanmin Junior High School MRT. This is the only MRT line I haven't been to each end of. There doesn't look like there's anything interesting around Luzhou Station itself. It is a little silly, but I'm going to have to go there one day purely for the sake of completeness. Most of the bits and pieces of old town Luzhou are around Zhongxiao Road. 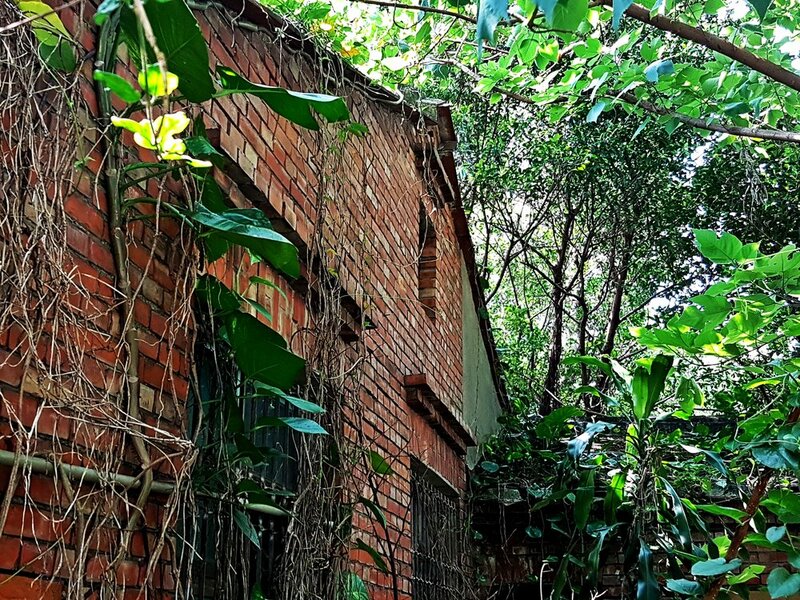 That was where I found this old brick house. At some point it was trapped in a narrow triangle of land by a new road. I really loved the tilework here. It reminded me a little of the elaborate tiled houses in Portugal. It's a shame ornate tilework has died out here now, but the practice of completely tiling buildings hasn't. A look inside revealed this place is abandoned, though it does seem fairly well kept. A plaque above the door is inscribed with the name 李興順, so it's possibly a smaller holding of the famous 李 (Lee) clan of Luzhou. Of the two larger temples in the town the Taoist Baohe Temple is sprawling and fairly uninteresting. Most of it was under renovation when I visited. The current structures are either modern or historic sections (the temple dates from 1910) that have been over-restored. This temple has some connections with the Lee family. They were patrons of the temple. The second temple, Yonglian, is a huge size for a downtown place of worship. Its stacked floors and balconies make it look a little like a cruise ship has beached in downtown Luzhou. The first incarnation of this temple was built in 1871 but the current structure is modern. 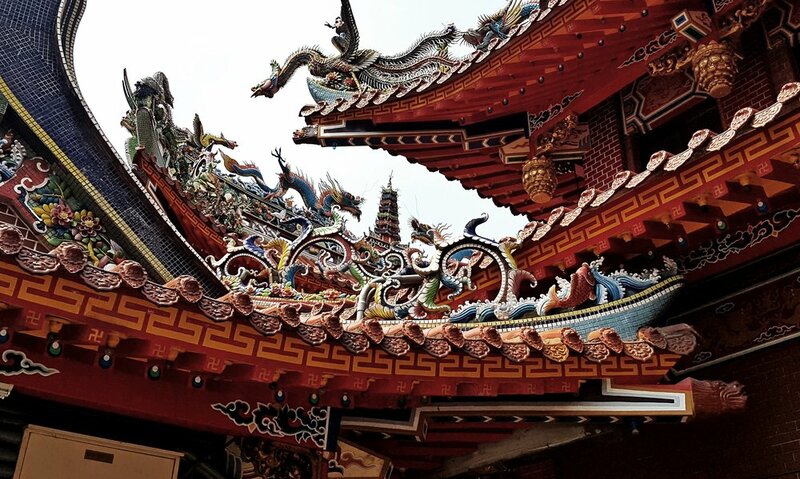 The sheer opulence of this Taoist temple belies its extreme wealth. A Guanyin statue made of kilos of gold sits upstairs. It has two security guards watching over it. This statue is valued at 425 million ntd (about 1.4 million USD) according to this story. The temple even recently donated a couple of police cars to the local department. After the temple I tried, and failed, to go to the Forbidden City Museum. I made the error of assuming it kept normal city museum operating hours. However it is a private museum and is only open at the weekend between 10 and 4. On my second trip I made it in. This is probably one of the strangest museums I've visited in Taiwan. It is absolutely stuffed with priceless treasures, and I really mean stuffed. It only covers a few rooms and so just about everything that could fit in, has been put in. This means giant sabers and tiny beard combs are sat right next to each other along with ancient juicers and temple artifacts. The entire collection is privately owned. 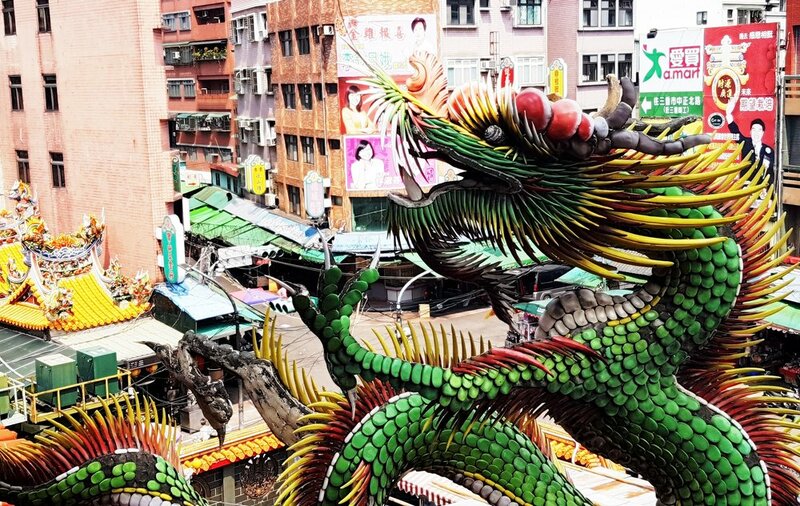 It was founded by a Taiwanese 4th generation descendent of master carvers and some of his work is on display too. The rest includes the fruits of years collecting. My guide said the items had been smuggled from China during the civil war, but perhaps not all of them were. A lot of the items in here are as good, if not better, than stuff I've seen at the National Palace Museum. And yet this place seems unknown. On the Saturday afternoon I visited I was one of two visitors. There is no English, very few labels, and you must be accompanied by a guide (almost none of the items are in display cases). Between our English and Chinese I could work out the age and history of quite a few items. Sadly no photos are allowed within the museum, so I only have pictures of the grumpy parrots, in the entrance and the garden. Some of the more impressive relics on display include a full size horse carriage made mostly from jade. There is a set of 2000 year old burial clothes for a prince of the Kingdom of Dian (modern day Yunnan) made from the same material. A heavy but intricate wooden screen depicts the Monkey Kings Journey to the West. Another ivory carving depicts the Moon Festival and has a globe with moving layers representing the phases of the moon. I have no idea how that was carved. There's even a jade piece of meat, except there aren't crowds of tourists surrounding this one. The other thing I should mention is the AC is either non-existent or extremely weak. I went on a sweltering day and it was very stuffy inside. The entire building does seems quite run down and pretty much a massive fire hazard. 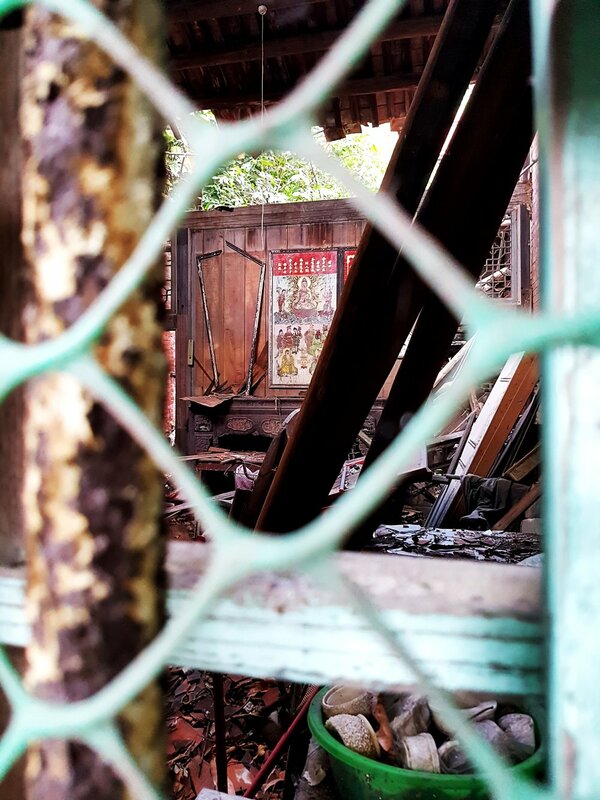 It would be tragic if this place was to burn down and really it needs a new building to do the collection justice. I headed down to this old farmhouse that I'd spotted from Google. It is a little rundown though still inhabited. 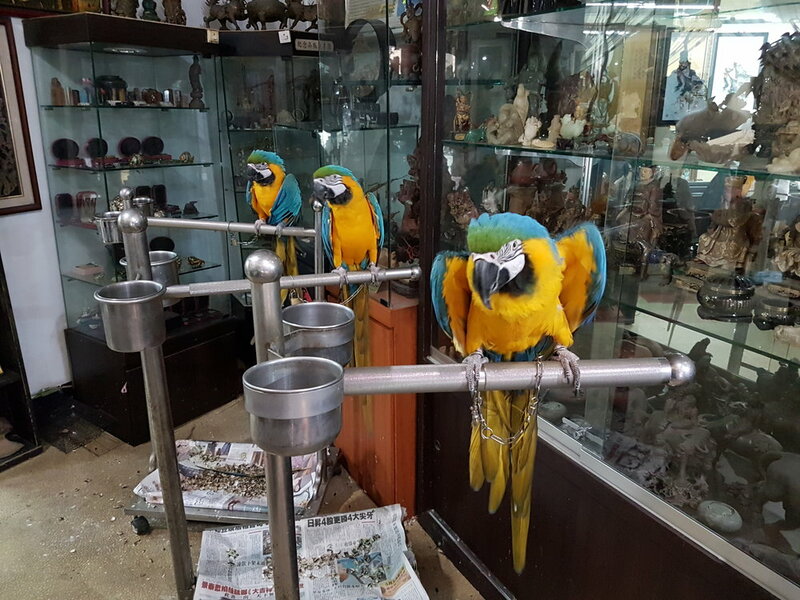 The owner has built up quite a collection of statues and windows. Just up the road is this pretty townhouse. 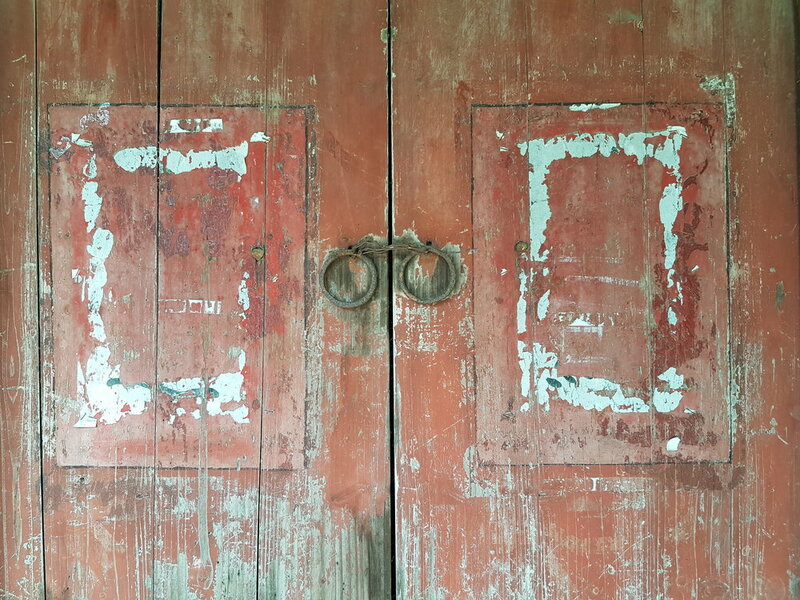 A friend told me it later was built by a wealthy merchant from Luzhou's rice farming heyday. I went a bit out of the way to what must have been a remnant of a farming village but the places around here weren't that special. For some reason there were roaches running around everywhere on these streets, like they'd all emerged from stasis at the same time. By the time I made it to the Lee Mansion I was melting. Luckily there was a small lake and I could stand in the fountain spray. 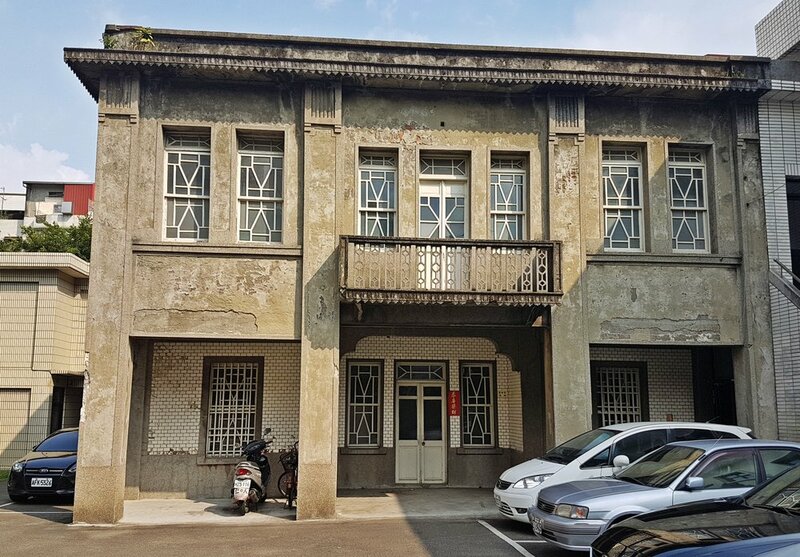 The Lee mansion was completed in 1903 (after a rebuild of an earlier house) by a family who gained their wealth from farming and expanding their land in Luzhou. At one point they owned a third of the land in the area. There's a very detailed history of the family and the house here. Unusually this house was voluntarily added to the list of protected buildings by the family themselves. 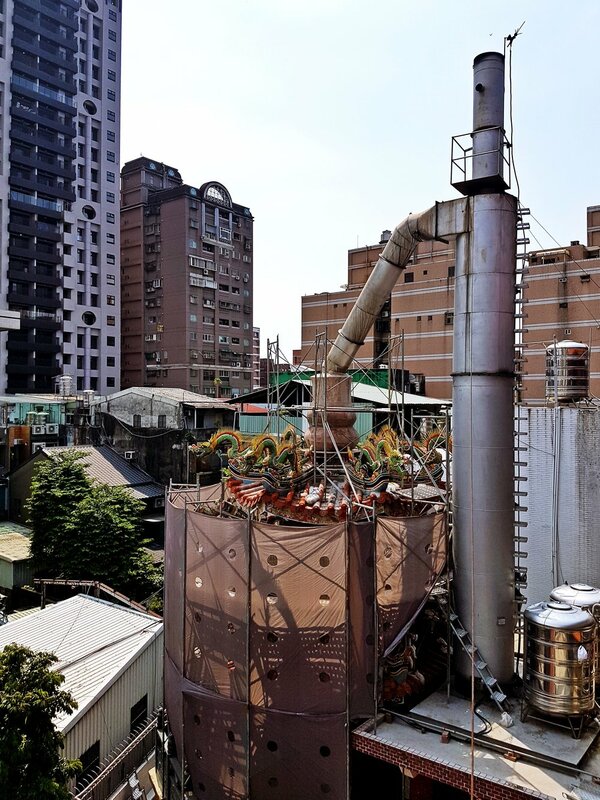 I can only think of one more building in Taiwan (the largest shophouse on Beimen Street in Hsinchu) of the top of my head where that's happened. Often the lure of riches from building apartments seals the fate of these houses. Compared to the Lin House in Banqiao and the Lin An Tai Home near Songshan airport this one isn't geared up for English speaking tourists. It's undeniably a beautiful house though and was totally visitor-less when I visited on a weekday. Most of the rooms are open and contain a lot of original furniture. However, if you've already visited the aforementioned homes there's no real need to visit this one too. After my first visit I found this site with a few more places of interest around Luzhou. That site also has some pics of this other grand old family estate in northeast Luzhou, demolished sometime around 2005. I decided to round out my second trip with a visit to these and hope to stumble upon anything else interesting along the way. The first was this austere 1930's mansion hidden in a car park. It's known as the octagonal house despite not being an octagon (something to do with the floor plan). It has been integrated with the chemical company office complex around it, although it was origianly built by a silver merchant. There aren't many of these orginal art-deco windows around anymore. The next place was located quite a long way from Luzhou old town through a lot of fairly boring suburban streets. 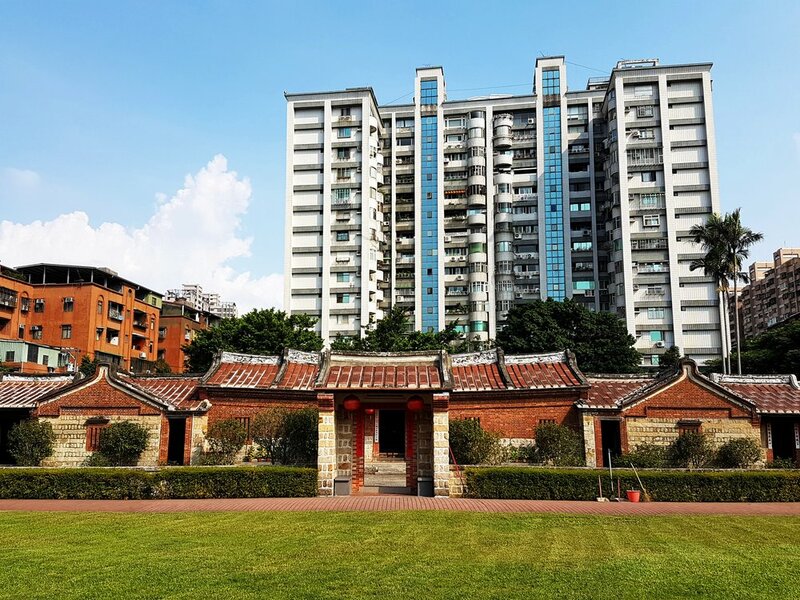 This building is known as the Xiyanglou, which means western style building. For a while it was the tallest building in Luzhou. It's really a few houses, the front is a sheer red brick facade but at the rear the building cascades down to some Fujian style blocks. 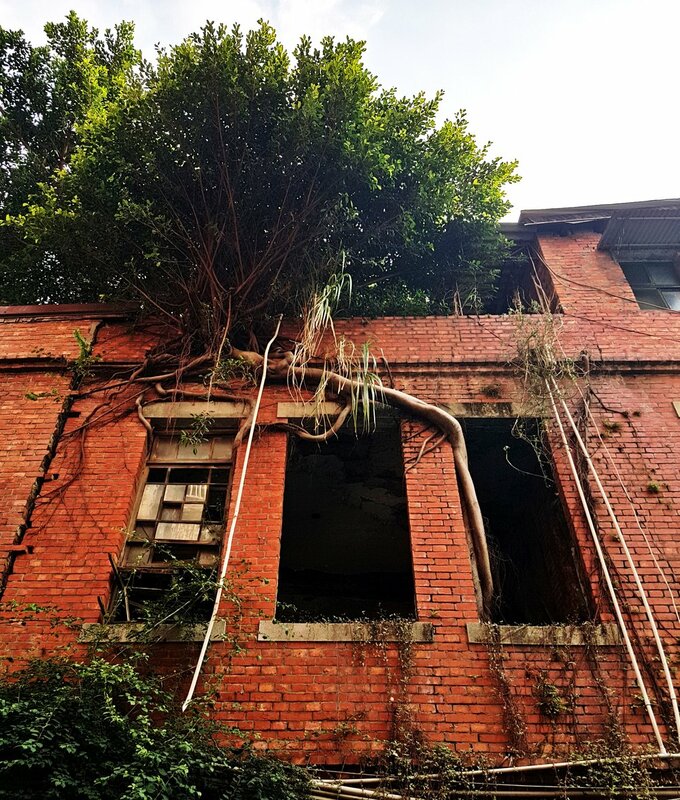 The middle third of the building has been derelict for quite some time and has a nice banyan snaking around the middle window. Sadly I couldn't find a way inside to see if anything interesting had been left. As such, unless you also really like this kind of thing, I can't really recommend coming out this far for one complex. So Luzhou went from being a vague spot of blankness in my psycho-geography of Taipei to actually being a well-defined place with a history and some interesting things. I'm surprised it's ended up such a long post. I've put almost all these sites on the Hidden Taiwan Map.